An all-star lineup of brunch favorites come together in this bread-free sandwich. Pan-fried hash browns create savory “buns” for a cheese-smothered sausage burger. A few slices of creamy avocado and crispy bacon, plus a fried egg top the patty for savory breakfast bliss. Using a clever mason jar hack, you'll be able to create a perfectly shaped sandwich! Grate potatoes into a medium-sized bowl. Add salt, pepper and two eggs. Stir until combined. Over medium heat, place three mason jar bands into a large pan. Spoon potato mixture into two bands, and crack one egg into the remaining band. Meanwhile, cook bacon and sausage patty. Once sausage patty is almost cooked through, top with a slice of cheese, and cover to melt. Peel and slice avocado. To assemble sandwich, start with one potato hash brown bun. 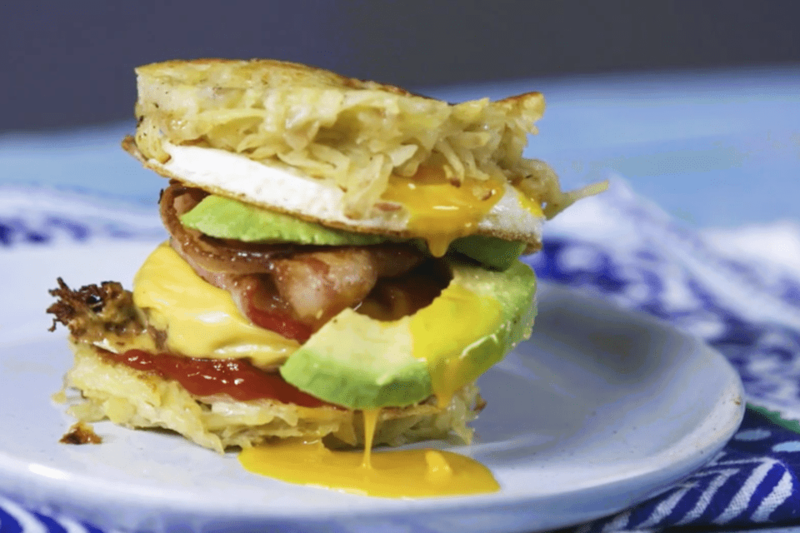 Layer with sausage, sliced avocado, fried egg, bacon, more cheese if desired and top with second hash brown bun.